I can remember exactly where we were when I received my first e-mail from Milly. It was really long, really sweet, and by the end of it I was pretty much set on working with this amazing person. It honestly made my day and I believe I didn't even wait to get back to a computer to reply - I just typed up an equally long and equally enthusiastic reply from my phone as we drove down the 395 from Lake Tahoe to Bishop. After email details back and forth, we "met" via a phone call - I remember that too, I was sitting in the lodge in Yosemite Valley. She was asking for advice on their Yosemite wedding and I loved getting to discuss details with her while in the park. She and Thomas hadn't been to Yosemite before, but when they decided to elope somewhere beautiful they both agreed it just felt right. She reached out to me to help choose locations and give them an idea of where to have their ceremony. When they received their permit, we were all hopeful Glacier Point Road would be open in time and with the above average snowfall this year we were pretty much on our toes until a few weeks before the wedding! As soon as I saw on the Yosemite instagram that they had plowed and opened the road, I texted Milly and I'm pretty sure we both did a happy dance across the country. 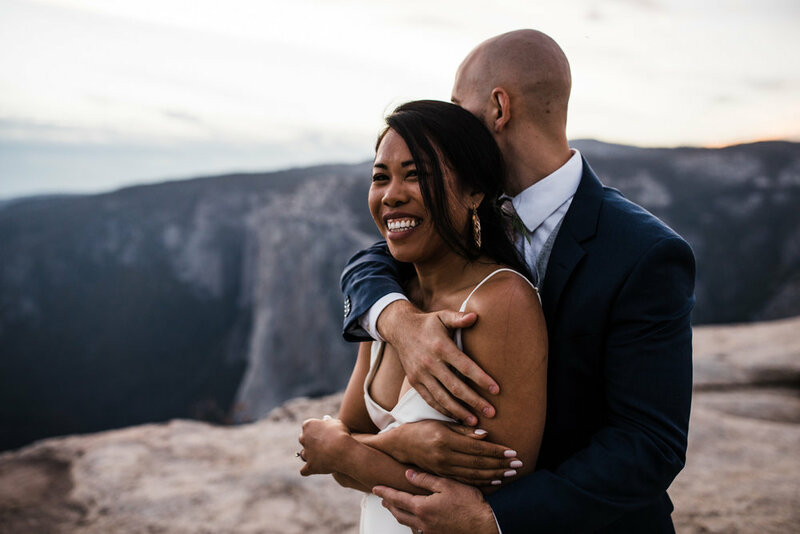 They invited their closest friends and family to join them for their intimate ceremony at Glacier Point and it truly was so beautiful. Honestly, no man-made wedding decoration could possibly surpass the beauty of a ceremony space flanked with Half Dome and Nevada Falls. It was stunning! Milly looked absolutely amazing in her Grace Loves Lace dress and rocked it all evening, including for a 2 mile hike through snow and mud out to Taft Point for sunset! They bravely quested to the thousand-foot viewpoints and stood together taking in Yosemite Valley as the sun set behind el cap. One of the amazing things about adventure weddings is the amount of time we get to spend getting to know our bride and groom. On "normal" wedding days, things can be so rushed and we don't get a lot of chill time, but with Thomas and Milly's wedding we got to hike 2 miles together which meant a lot of talking and getting to know each other! We had some amazing conversations hiking back with the moonlight and our headlamps to guide us and by the time we made it back to the cars we felt like we had two new friends!